I have been back from my holiday for over a week and have been trying to get back into the flow of things. I actually did very well in the first few days and made a great start on my new 50 challenges of this year. 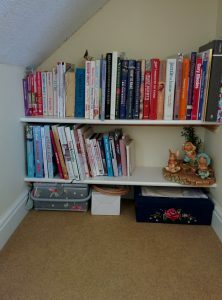 Just to recap, I plan to cook 50 recipes from all the lovely cookery books I have in my special corner. 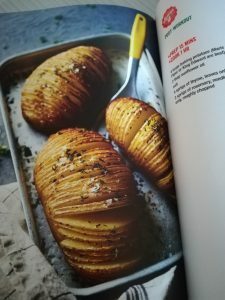 So I made lots of hints before my birthday and was delighted to receive the new book by Joe Wicks (the Body Coach), Cooking for Family and Friends. Joe has three other books out and whilst Jordan has cooked a few lovely recipes from them and I have cooked a few, I have not followed as a healthy eating plan. What I like about him is he does make food sound like a friend and not an enemy. He takes away the calories as most of the recipes are higher in calories than the normal diet books but he encourages you to exercise. I am a great believer in eating and exercising although I have to confess I am doing far much of the eating and not enough of the exercise lately. Once I had my holiday washing sorted, I sat with the book and looked for a recipe to try for my first week. There was so many recipes that I wanted to try and I was drooling looking through. As Jordan was going to be home for a week and also Kathryn was around too, it was a good week to be cooking something from the book. In the end, I decided on Baked Chicken Sausage Risotto but before this was cooked, I couldn’t resist trying something from the sides section, Hassleback Potatoes. I know that I shouldn’t be surprised but I was amazed when I finished cooking and the completed dish looked like the picture in the book! Now for the baked chicken sausage risotto. I am trying to plan my meals so I have a category for each day. I remember when I was growing up, we had certain food each day of the week. I didn’t have healthy foods but I thought that the they could be incorporated into one day of the week and I would call it “Comfort Tuesday”. It will include all the foods I love to make me feel better about life; simple egg and chips were Monday’s meal, a mince dish for Tuesday (who doesn’t love cottage pie on a cold day) and sausages on a Wednesday. Confession time here; I didn’t like Wednesdays. Rupert was on the TV (I don’t know why I didn’t like him and his checked trousers!) and the sausages were never nice. I love sausages now and always go for healthy ones. 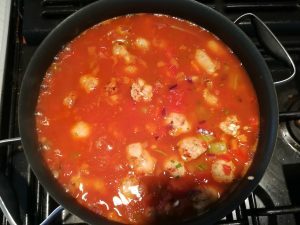 I often make meatballs with them and whilst tomato ketchup isn’t a favourite of mine, one of our favourite sausage recipes is sausages marinated in tomato sauce, honey and mustard. So to get Comfort Tuesday started, this was a perfect recipe. Whilst I think I might have made a risotto before, rice isn’t something I have mastered. I tend to stick to bags otherwise I end up with a sticky mess. 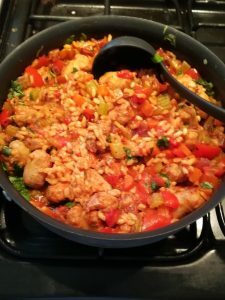 The recipe stated that baking risotto is much easier as it only requires a few stirs and the oven does the rest of the hard work. Sounded like my kind of recipe. 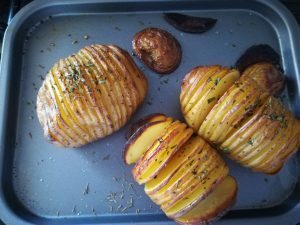 Most of the ingredients needed were ingredients I always have in the cupboard or fridge so I didn’t need to buy too many extra bits. I did buy some fresh herbs but think I might actually start growing my own. I am inspired by one of my 50 birthday challenges to grow vegetables that I think growing herbs would be a wonderful thing to do. Although the day I chose to cook this was a particularly hot June day, I did actually enjoy the process of getting the ingredients prepared. 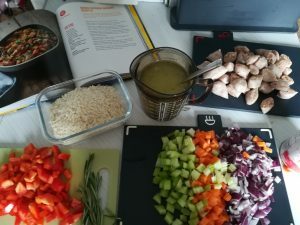 The recipe stated 10 minutes preparation; Tina’s time was around 25 minutes! My normal plodding time. The ingredients certainly looked good. I needed a large hob-proof casserole dish or ovenproof saucepan that I could use on the hob then put in the oven. The pan I used was one that I bought 7 years ago from Lakeland. I have used it quite a lot and it cooks and cleans very well. The only disadvantage is the handles do get very hot so you have to be very careful when cooking with it. I will replace it sometime but it does the job for now. 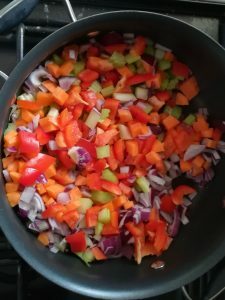 I had to start with frying the ingredients in coconut oil. As a bit of a Rosemary Conley fan, I don’t tend to use oil but my new attitude to cooking and eating is enjoy the food so I am open to most things now. The frying up didn’t take long and I did manage to cook the dish in the 35 minutes, the time stated. On a warm June Tuesday evening, we were able to sit down to a very tasty meal. It is one that I will make again and hoping to share it with some of my friends. It was a family affair and recipe one completed.